Harold Schnitzer's z"l legacy has the distinction of including the single largest gift ever made to Jewish Portland. In November 2012, Harold's wife Arlene and his son Jordan gifted the Park Tower Apartments, valued at $16.6 million, to OJCF in Harold's memory and honor. "It was always our goal to give back to the community and in Harold's words 'to do noble good,'" said Arlene. 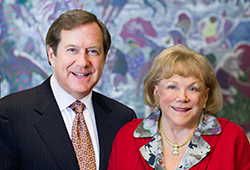 Harold, Arlene and Jordan Schnitzer have for decades sought to support the community that they grew up in and that they feel did so much for them. "My father felt a great sense of responsibility to take care of the charitable institutions that serve our community," said Jordan. "This gift reinforces his mission of creating greater sustainability for these organizations and to inspire others to join in the effort at whatever level is right for them." To OJCF's founders, this gift symbolizes the fulfillment of their hopes for the foundation and the good of the Jewish and general community. In December 2012, OJCF sold Park Tower Apartments to Cedar Sinai Park (CSP). CSP can now complete its plans for a four-building, low-income housing complex downtown that will offer a range of services for seniors. The proceeds from this momentous gift have funded the Harold and Arlene Schnitzer Family Fund of the Oregon Jewish Community Foundation.